As you think about your Annual Marketing Plan there are many ways to root your strategy. Seasonality based campaigns are a smart and dependable way to increase brand awareness and of course, drive sales upward. Below are fail proof ways to make sure you connect with your consumer guided by data (along with some gut marketing too) to create a Marketing Plan that has impact when and where it should for your customer! 1. Go to YOUR data and define your sales cycle - Gather the sales data and mine the information you have in your respective CRM system. Don’t have a CRM system? Spend some time with your sales folks or person directly responsible for getting product in hand or service deployed for insights into the sales cycle. Purchase exploration/consideration/action/sale/follow through, etc. 2. Keep an eye on Google search trends. 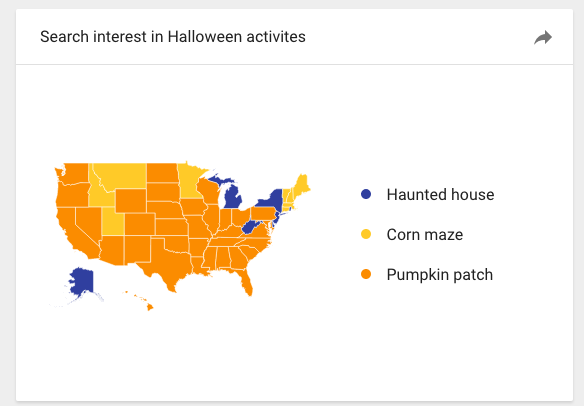 Google has a really powerful and handy tool – thanks to the folks @ Google.com - https://trends.google.com/trends/ You can see what’s trending right now or by category or by location. Play around with the tabs on the left hand side and you can search and compare anything. Here is a snapshot of healthy snack foods vs diets that work. Thinking about the New Year’s resolution “mindset” I mention here. Below is the kind of data I could spend hours looking through. 3. Survey your target audience or existing customers. Surveys are easy these days with the help of SurveyMonkey or GoogleForms. Survey monkey has audiences you can send your survey to (for a fee) and they have suggested questions if you can think of your own. Google Forms is simpler, but very handy for sending a quick survey to your existing contacts. For statistically reliable date that you’d want to base decisions on – the MINIMUM # of responses you should aim for is 100. Anything below is interesting and relevant, but proceed with caution. 4. Timing – Once you have a sense of sales cycle and trends back into your overall timetable. Consider how much product will need to be produced. If the sales cycle states that interest before purchase is 45 days; then your marketing starts around 45-60 days. Allow prep time for the plan itself and the necessary creative assets to launch. With an eye toward agility – maybe shifting along the way depending on how topical or relevant your pitch needs to be. I remember when I worked at Ogilvy on the media plans for Country Time Lemonade – we had provisions for “weather testing”. We would instruct the radio stations to run our ads twice as much if the local temperature was 90+ degrees. Makes sense, right?! Planners, Calendars & Journals OH MY! The company I work for is up for sale?! Five suggestions for coping.